Bobby Portis hit the ground running in his Wizards debut, popping off for a team-high 30 points on 12-of-18 shooting to go with four triples, six boards, two assists, one steal and two turnovers across 27 minutes with the second unit. He was ultra-aggressive in seeking out his own shot the second he stepped on the court, racking up a quick 16 points without missing through his first 5.5 minutes of play, and he finished the game with a robust 31.8 usage rate. Portis also drained both of his freebies to give him an elite 79.4 true shooting percentage on the evening, and it wouldn’t be surprising to see him eventually replace Jeff Green in the starting lineup. Either way, you couldn’t have asked for a much better debut from Crazy Eyes, and while he can be inconsistent, it looks like he’ll see a major boost with the move. His arrival isn’t great news for Thomas Bryant, though, as he saw his minutes reduced to 19 and finished with 13 points, six rebounds, one steal and one block. Scott Brooks has kept Bryant on a short leash his rookie year, and it’ll only get worse once/if Dwight Howard (back) returns, so he’s trending towards cut-candidate territory. Jabari Parker was also solid in his Wizards’ debut, hitting 3-of-6 shots on his way to seven points, 11 rebounds, nine dimes, three steals and one block in 23 minutes off the bench. He didn’t look for his shot in the same way Portis did, but he did an excellent job running the offense and also finished without a single turnover. Washington’s desperate need for another creator in their second unit may allow Scott Brooks to overlook some of Parker’s issues on the defensive end of the floor, and it’s not like Jabari has a ton of competition for minutes on this depleted Wizards’ team, so he should be able to see quality minutes moving forward. Parker won’t often bring many defensive statistics to the box score, and he has struggled with turnovers this season, but he should do enough with the points, boards and dimes while offering a trickle of triples to warrant a roster spot in most settings. Otto Porter Jr. only missed twice in his Bulls’ debut, registering 18 points, four 3-pointers, four rebounds, one assist and two turnovers through 34 minutes as a starter. Porter often struggled to assert himself in the offense in Washington, and his minutes rarely exceeded the 29-minute-mark, but he has almost no competition for playing time in Chicago and the Bulls will be asking him to be more aggressive with his shot. It’s technically a great spot for him, but all of that kind of goes out the window when you realize his coach is Jim Boylen; a guy who isn’t afraid to bench his entire first unit for lengthy stretches – seemingly at a whim. On paper, Porter should be looking at minutes in the mid-30s and plenty of shot-making opportunities, but it’s ultimately on Boylen how this will all play out. Tobias Harris had an okay game in his Philly debut, scoring 14 points on 6-of-12 shooting to go with eight boards, two triples, three dimes, one steal and zero turnovers through 32 minutes as a starter. There’s absolutely no way that Harris will be able to sustain his top-25 pace while fighting for touches with the likes of Joel Embiid, Jimmy Butler, Ben Simmons and J.J. Redick (is he the third or fourth option with that group? ), but it’s not like he’ll fall off a cliff either. Harris does have a very well rounded game, he’s ultra-efficient, and has never really been a usage rate monster so maybe he’ll be able to flirt with top-60 value moving forward. In a best-case scenario, I’d say that his numbers with the 76ers could resemble something similar to what he did two years ago during his 2016-17 campaign when he put in averages of 16.1 points, 5.1 rebounds, 1.7 assists and 1.3 triples per contest on 48.1% shooting. Harrison Barnes logged 37 minutes as a starter in his Sacramento debut, finishing with 12 points (3-of-9 FGs, 4-of-4 FTs), seven rebounds, two 3-pointers, two assists and one turnover. Barnes is what he is, not amazing, but probably worth owning. Tyler Johnson flopped in his Phoenix debut, going just 1-of-9 from the field and 2-of-2 from the line on his way to five points, one 3-pointer, two assists, two steals and two turnovers in 28 minutes off the bench. Johnson can be hit-or-miss, but he’s looking at a ton of opportunity with the Suns, and it wouldn’t be shocking to eventually see him establish himself as their starting point guard. There’s enough upside here that I’ll give him another few games before making a decision about cutting him. Stanley Johnson looked like Stanley Johnson in his Pelicans’ debut, scoring six points on 3-of-7 shooting to go with two rebounds and one steal in 20 minutes off the bench. Alvin Gentry runs a fantasy-friendly system, and the Pelicans don’t really have a traditional three-man, so Johnson is going to have every opportunity to change the narrative on his career as he finishes out the season in New Orleans. Whether or not he’ll do that is another matter entirely, but at the very least, he’s worth keeping an eye on in deep leagues. Sviatoslav Mykhailiuk saw just nine minutes off the bench in his Pistons’ debut, connecting on one 3-pointer to go with two assists, one rebound and one turnover. Second-round picks rarely have relevant rookie seasons, and it’s pretty obvious that Mykhailiuk won’t be breaking that trend. Thon Maker was scoreless in his eight minutes off the bench in his Detroit debut, finishing with just one rebound and one turnover to his credit. As long as Blake Griffin and Andre Drummond are healthy, Maker will be safe to ignore in all settings. Anthony Davis (finger) picked up right where he left off after spending a little over two weeks on the sidelines, scoring 32 points on 11-of-15 shooting (10-of-11 from the stripe) to go with nine rebounds, two assists, three swats and two turnovers in just 25 minutes of floor time. The Pelicans won’t be outright shutting him down, but his minutes will be monitored, he won’t play in any back-to-back sets the rest of the way and could miss random games here and there for relatively minor injuries. The good news is that the Pelicans only have three more back-to-back sets this season (February 22-23, March 1-2, March 15-16), but the bad news is that a minor ankle/back/anything issue will likely cost him multiple games. I could see him sitting out the final few weeks of April, so I would recommend trying to flip him once he gets a handful of games under his belt. I’d easily do a 1-for-1 deal involving AD for James Harden, Kevin Durant, Paul George, Kawhi Leonard, Karl-Anthony Towns, or Giannis Antetotkounmpo, and I’d be happy to do Rudy Gobert, Damian Lillard, Nikola Jokic or Nikola Vucevic if a +1 was attached. If you can’t get that sort of value, then I’d probably just stand pat and hope for the best. 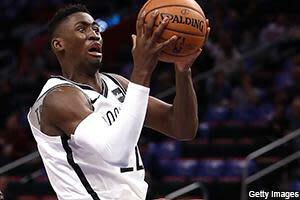 Caris LeVert (foot) made his return to the court following what was nearly a three-month layoff, scoring 11 points on 5-of-11 shooting (1-of-2 from the line) to go with two rebounds, four assists, five steals and zero turnovers in 15 minutes off the bench. He’s going to be operating with a “minutes suggestion” from the Nets’ medical staff as he works his way back, but he should be fully up to speed by the time the fantasy playoffs roll around, so he’ll be a difference maker for anyone who stashed him. His return to action absolutely obliterates Shabazz Napier’s value, and D’Angelo Russell figures to take a fairly substantial hit once LeVert is back up to speed. Remember, through the first 13 games of the season when LeVert was acting as the lead dog for Brooklyn, Russell was operating with just ninth-round value behind averages of 15.7 points, 5.1 assists, 2.2 triples, 1.0 steal and 2.2 turnovers per game on 40.9% shooting while only receiving 26.9 minutes a night. D’Lo is a guy who needs a lot of volume to produce, but with the Nets getting healthy, he won’t be operating with the rock as much. Spencer Dinwiddie (thumb) should be back by late-February or March, which will only further complicate the backcourt rotation in Brooklyn, so again, selling high on D’Lo makes a ton of sense to me. Kevin Love (foot surgery) started in his return from a three-month absence on Friday but finished with just four points on 1-of-5 shooting (2-of-2 from the stripe), one rebound, one assist and nothing else across six minutes. He’s obviously going to be brought along very slowly, and efficiency will be an issue for him with zero spacing in Cleveland, but hey, at least he’s back. I’d say the late-season shutdown risk is high here, but those who are sitting comfortably in the postseason standings may want to reach out with some low-ball offers. Conversely, if you’re struggling in the standings and fighting for a postseason berth, selling Love for pennies on the dollar would also make sense. Jeff Teague (foot) looked great in his return from an eight-game absence, hitting 6-of-7 shots on his way to 12 points, four rebounds, five assists and three turnovers in 17 minutes off the bench. The Wolves will likely be easing him back into things given how much trouble he’s had with his left foot this season, but he should be fine for Monday’s game and hopefully, he’ll be able to really get himself right with some extended rest over the All-Star break. The usually reliable Teague has had a tough time staying on the court this season, but it’s worth noting that he was a top-25 stud after the All-Star break last season, so the upside is there. He just needs to get healthy. Marc Gasol (trade pending) and Kawhi Leonard (knee) are questionable for Saturday’s game against the Knicks. Given the opponent, it wouldn’t be surprising to see Leonard take the night off, which would translate to Fred VanVleet moving back into the starting unit. It’ll be interesting to see where Gasol fits into the rotation in Toronto, but I imagine he’ll be coming off the bench behind Serge Ibaka on most nights, which isn’t great. Still, he’s at less risk of a late-season shutdown playing in Toronto, and perhaps he’ll be able to improve his efficiency with the improved talent around him. He’s talented enough that he should be able to hit value even if he’s only averaging 25 minutes a night, but Ibaka figures to take a decent sized hit. Jahlil Okafor (ankle), E’Twaun Moore (quad) and Elfrid Payton (ankle) did not play, and they should be considered questionable for Saturday’s game in Memphis. Okafor is going to take a fairly substantial hit with AD back in action, so he’s more of a handcuff for Davis owners at this point. Non-Davis owners may need to consider cutting him, but given how good he was, I’d wait and see what his role looks like upon his turn before truly giving him the ax. Cedi Osman (ankle) missed his second game in a row on Friday, and he should be considered doubtful for Saturday’s game in Indiana considering he still hasn’t been able to practice. Larry Nance, Marquese Chriss and Ante Zizic will log most of the frontcourt minutes while Osman and Tristan Thompson (foot) are out and Love is eased back into things, with Nance being the guy you want to own out of that group. Luka Doncic underwent a precautionary X-ray on his left hand following Friday’s game, which came back clean, although it wouldn’t be surprising to see a follow-up MRI on Saturday. The Mavs have a Sunday-Monday back-to-back set coming, so there’s a chance he could sit out one of those, although he has tended to power through injuries his rookie year. That said, if he is forced to the sidelines, Tim Hardaway Jr. would take on a more proactive role in the offense and there would be more opportunity for guys like Jalen Brunson, Trey Burke and Dwight Powell. Owners can expect to get another update by Sunday morning at the latest. Jerryd Bayless (toe), Tyus Jones (ankle) and Derrick Rose (ankle) did not play Friday, and they should be considered questionable for Monday’s game against the Clippers. If all of them are out again, Isaiah Canaan could be looking at another start with Jeff Teague operating as his primary backup. Gary Harris (groin) and Paul Millsap (ankle) did not play Friday, and they should be considered questionable for Monday’s game against Miami. Malik Beasley and Mason Plumlee will continue to start while those two are out, with Beasley offering the most upside. Khris Middleton was rested on Friday, but he’ll be good to go for Saturday’s game against the Magic, which will push Tony Snell back to the second unit. Nikola Mirotic (calf) did not play Friday and he should be considered doubtful for Saturday’s game. There will be less of a shutdown risk for Mirotic in Milwaukee, but he also won’t see quite the same opportunity on offense as he did in New Orleans. Still, I think it’s reasonable to expect top-75 value from him, pending health. Devin Booker (hamstring) and T.J. Warren (ankle) did not play Friday, and I wouldn’t expect to see either of these guys take the floor again until after the All-Star break. Josh Jackson and Deandre Ayton will continue to do the heavy lifting on offense while these guys are out, and there will be more opportunity for Kelly Oubre Jr. and Mikal Bridges. Isaiah Thomas (hip) got in a practice with Denver’s G-League squad on Friday as he continues to inch his way closer towards a return. He could be back by late-February, but will obviously be brought along slowly, and it could be tough for him to make much of an impact with all the depth in Denver’s backcourt. There’s nothing wrong with stashing him if you have an open IR-spot, but I wouldn’t expect much. Wilson Chandler (quad) will not play on Saturday against the Celtics, but JaMychal Green (knee) and Garrett Temple (shoulder) are not being listed on the injury report. Green could get the start at the four-spot with the departure of Tobias Harris, so he’ll be someone to keep an eye on in deep leagues. Landry Shamet will be available to make his Clippers’ debut on Saturday, but it’ll be tough for him to make much of an impact in Los Angeles’ crowded backcourt. Kyle Anderson (shoulder) will not play Saturday against the Pelicans, but Avery Bradley, Jonas Valanciunas (thumb) and Delon Wright should be good to go for their Memphis debuts. JV is going to see a massive boost in value in Memphis, as there’s a chance he’ll finally be able to flirt with 30-plus minutes a night, and Wright is worth monitoring in deep leagues. Joakim Noah (heel) is questionable for Saturday game, in addition to being irrelevant in fantasy hoops. J.J. Redick (illness) returned from a two-game absence and produced 34 points (11-of-15 FGs, 6-of-7 FTs), six 3-pointers, three rebounds, three assists and three turnovers across 33 minutes. He should be fine for Sunday’s game against the Lakers. Jonathon Simmons (abdominal) did not play Friday and he should be considered questionable for Sunday. Daniel Theis (knee) is questionable for Saturday’s game against the Clippers. If he’s out, Robert Williams will see more time as Al Horford’s primary backup with Aron Baynes (foot) still out. Ish Smith logged 18 minutes off the bench in his return from a one-game absence, finishing with 11 points, four rebounds, two assists, one 3-pointer and two turnovers. He’s not worth owning in most leagues. Doug McDermott (rib) is questionable for Saturday’s game against the Cavs. Tony Parker (back) will not play Saturday vs. the Hawks, which will lead to more minutes for Devonte’ Graham. Emmanuel Mudiay (shoulder) and Frank Ntilikina (groin) did not play Friday, but they’re more or less irrelevant with the arrival of Dennis Smith Jr.
Thabo Sefolosha (hamstring) is questionable for Saturday’s game vs. San Antonio, but whether he plays or not is irrelevant in fantasy hoops.